We are sometimes asked why we sell our leads for $0.25 to $0.50 each, while some of our competitors sell leads for $0.07. 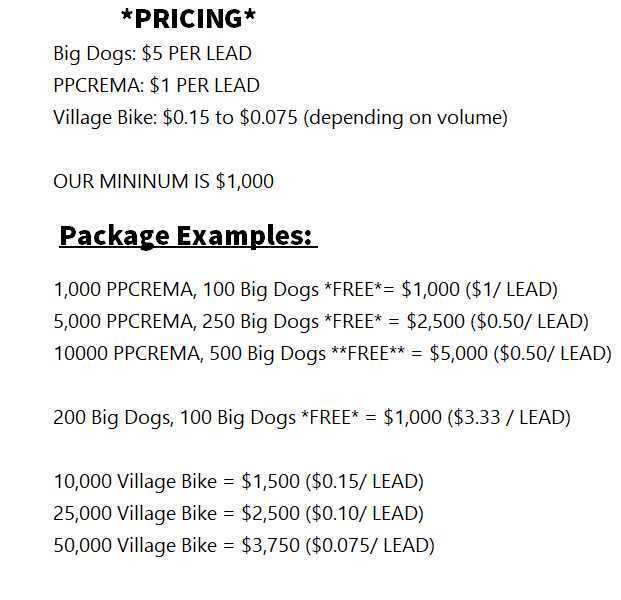 We’d like to take this opportunity to explain the difference between our leads and those of the competition. In the end, we think you’ll agree with us that the quality of our leads is well worth the price. Real Accredited Investor Data, Not Models —We prepare special lists that only include leads that meet certain criteria. For instance, our list of accredited investors only includes leads who have $1 million in wealth (excluding home value) or have earned $200,000 over each of the last two years. This kind of information is vital for various investment clients who can only make private placement offerings to accredited investors. We collect our data from surveys performed by Series 7 and Series 24 Brokers at least twice in the last six months. These lists are the highest quality. Did you know that many of our competitors sell lists of accredited investors based on Zip Code + 4 modeling? This data is only 65 percent accurate! That means you are paying for crappy data. Telemarketing efforts based on these lists will surely backfire, as most people on the list have never expressed interest in private placements. The only payoff you are likely to receive from calling these listees is an angry response. Financial customers who buy lists of accredited investors on-the-cheap are getting junk data. They may think that they can spend a few hundred dollars on lists that will provide them with names willing to invest millions – not the kind of people we want to deal with. SalesLeads.tv serves a client base that values the quality of accredited investor lists and understands the extra costs in using certified surveys instead of screwball Zip Code models. It pertains to residences, not businesses. It allows phone calls to be placed by political, non-profit and survey organizations. Bill collectors cannot be blocked by the DNC Registry. Businesses with pre-existing relationships over the last 18 months can continue to call. The enforcement of DNC is shared by the Federal Communications Commission and the Federal Trade Commission. Offenders may be sued in court and be subjected to significant fined. SalesLeads.tv screens all leads against the DNC Registry. You will never be sold a non-compliant lead. Can you be sure that the seven cents crowd is going through the time and expense to certify that all their leads are DNC compliant? State Compliance: Most states have their own DNC Registries, although some have merged their lists into the national one. We check each lead for state DNC compliance before we certify it for sale. We pay for access to the state lists, which is factored into the prices we charge. Could it be that the seven cents guys are not bothering with state lists? Duplicates: We make an extra effort to eliminate duplicate leads. Duplicates can occur when two or more names or spellings refer to the same lead. For instance, Mary Jones and M. Jones may be the same person. We are very good at weeding out duplicates. Do you think the low-ballers care? As you can see, we are passionate about the quality of our lists. When you buy from us, you get the peace of mind knowing all our leads our certified compliant, based on real survey data and legitimately categorized, guaranteed. We invite you to give us a try and see for yourself!